I got mine from www.nuelectronics.com. It is a Freeduino V1.16 Board. Very good price. I also got a ProtoShield Kit and an Ethernet Shield. These will be used when the project is completed. When I first got the circuit built and SW loaded, nothing worked. This caused a bit of a problem, as I didn't know what to do. After much research and gnashing of teeth, came accross this link 'www.xplmonkey.com/homeeasy.html'. This was not the first time I had seen this link but it was the first time I understood the significance. Have a read of it. The basic jist of it is that Homeeasy uses two protocols, Basic and Advanced. The Basic protocol uses Group Letters (A-?) and Unit Numbers (1-16), whereas the Advanced uses, basically a more advanced protocol using addresses etc. We are just dealing with the Basic protocol here. So, the solution to my problem. I was using the HE300 On/Off Remote that came with the Socket Pack. Funnily enough, this uses the Advanced protocol only. Who would have guessed? The HE200 looks more advanced then the HE300. 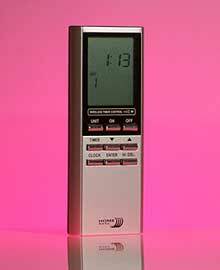 You live and learn What I needed was the HE200 Timer Remote, which uses the Basic protocol. So, I popped off to B&Q the next lunch time and aquired one. €30 Argh!! When I cam home, later that day, I tried it and of course it worked. 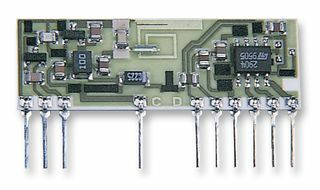 The bottom line is you will need a HE200 if you want to test the receiver circuit. I went to Maplins and got a 'Transmitter Receiver Pair' part number 'VY48'. It contains a 433MHz transmitter (AM-RT4) and a 433MHz receiver (AM-HRR3). The PDF explains all the connections required. 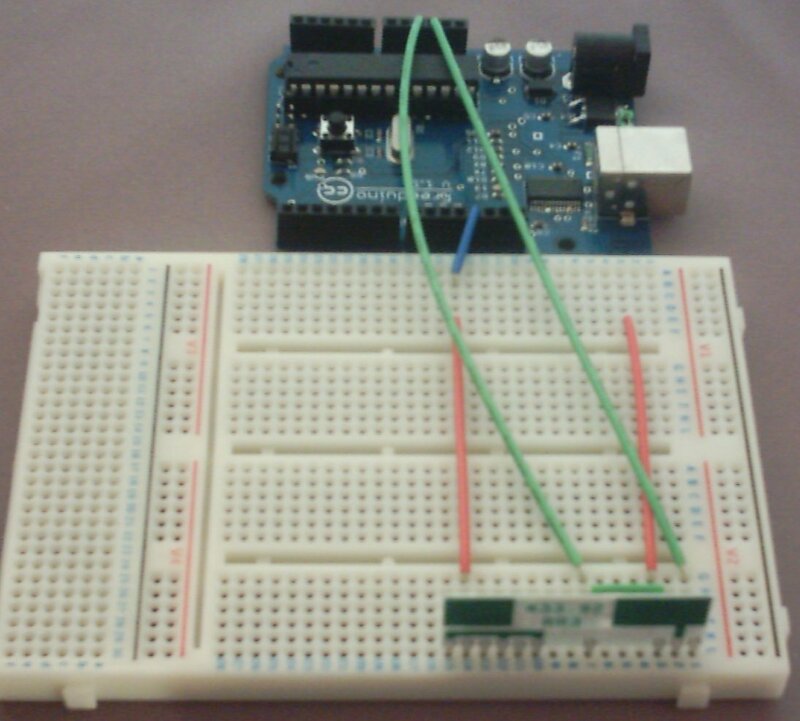 I got a breadboard from Maplins, for convenience of assembly. It just makes it easy to change the connections, etc. I also picked up a Jump Wire Kit also for handiness. The first thing I did was construct a receiver, which is shown in the images below. 1. Connect the power pins 1, 10, 12 and 15 together. 2. Connect the GND pins 2, 7 and 11 together. 1. Connect the Power from the circuit pin 1 to the 5V. 2. Connect the GND from the circuit pin 7 to the GND. 3. 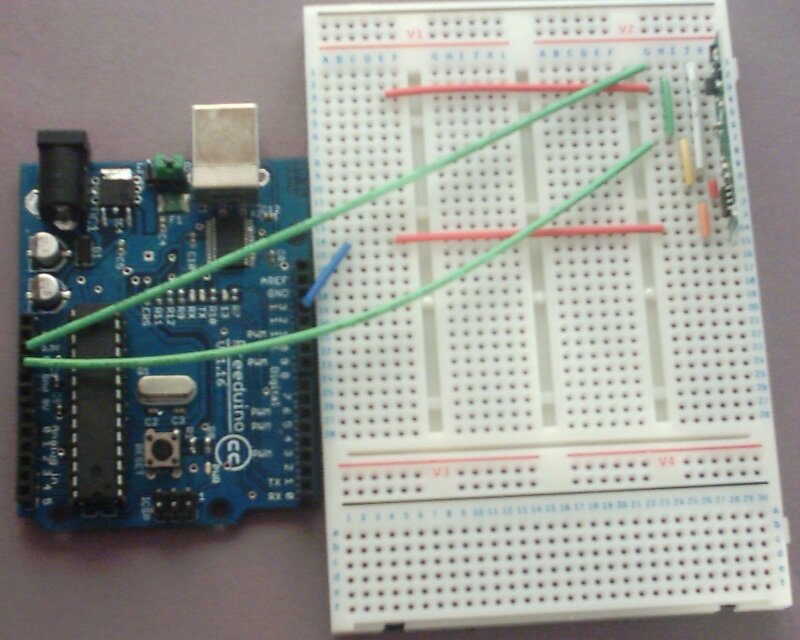 Connect the Data Out from the circuit pin 14 to the pin 12. Now, you need to set-up the software side. 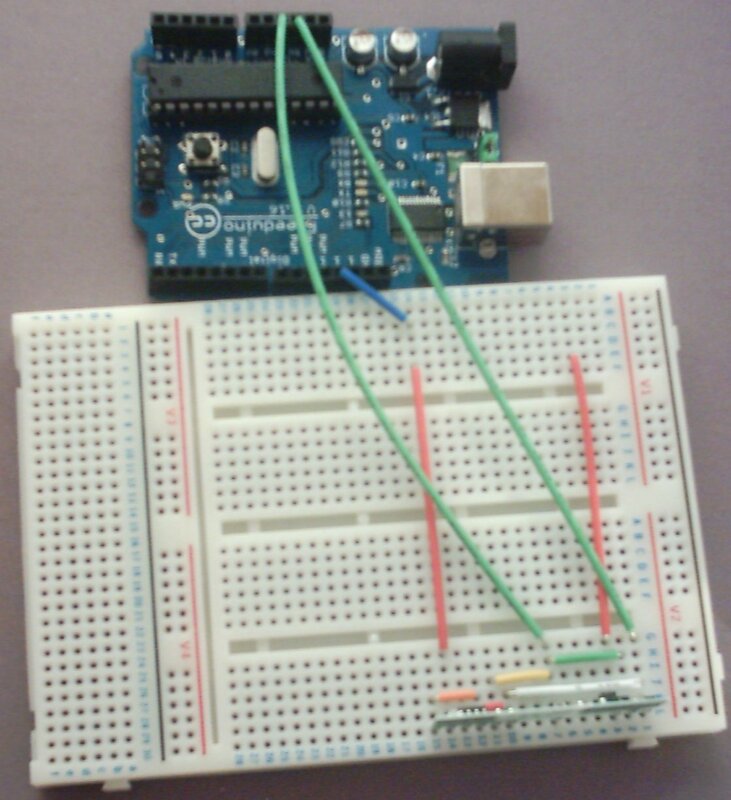 This presumes that you have a working Arduino with IDE (Integrated Development Environment). The software was found from a visit to James Taylors site 'Notes from a small field' titled 'Home Easy page on Arduino Playground'. 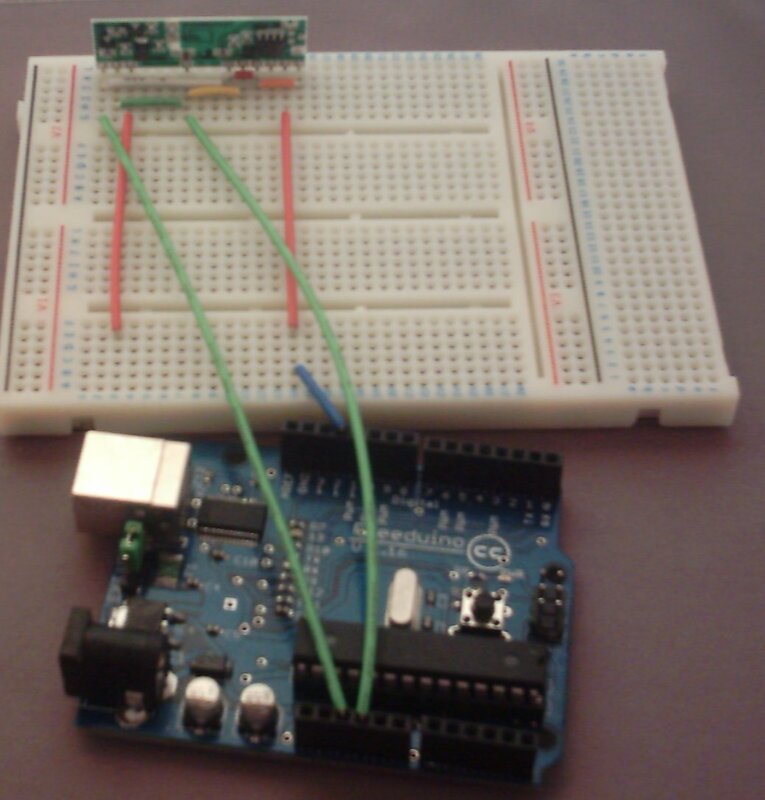 I got the software from the Arduino: Playground. There are three programs, the first is the on we need, in this case. It deals with receiving the Homeeasy Basic Protocol. Just download it or copy it into your IDE and upload it to the Arduino. Switch on the serial monitor and watch it work. I found the position of the remote relative to the antenna is important. There is a lot of intereference from the laptop I use, so I normally position the device about 1 metre from the laptop.